As in our first-quarter analysis of Bay Area housing markets that posted the largest annual price gains, most of the 70-plus communities in which Pacific Union operates saw annual appreciation in the second quarter. Silicon Valley communities continued to experience significant year-over-year price increases, with Woodside, Atherton, and Menlo Park again ranking among the top 10 markets with the highest appreciation. Woodside — up by 122.2 percent — After ranking No. 6 for annual price appreciation in the first quarter, Woodside took the top spot on the second-quarter list. After reaching a three-year low of $1.8 million in the second quarter of 2017, home prices in the San Mateo County city climbed to $4 million in the second quarter. 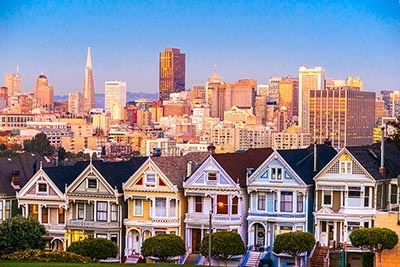 San Francisco District 6 — up by 98.6 percent — Home prices in the city’s District 6 — which includes Lower Pacific Heights, Hayes Valley, and Alamo Square — climbed to a three-year high in the second quarter, with a median sales price of $3.57 million. As in Woodside, the appreciation was so significant because prices in District 6 were at a three-year low in the second quarter of 2017. San Francisco District 8 — up by 55.0 percent — In San Francisco’s District 9 — which encompasses neighborhoods like North Beach, Russian Hill, and Nob Hill — the median sales price ended the second quarter at $3.56 million. A $16.5 million sale in mid-April helped boosted the year-over-year price gain. Atherton — up by 40.0 percent — While Atherton‘s annual appreciation slowed from the first quarter, when it was the No. 1 Bay Area housing market for that metric, home prices here are still eye-popping, closing out the second quarter at $6.65 million. Nine homes sold in Atherton had eight-digit price tags, three of them higher than $20 million. Glen Ellen — up by 33.3 percent — This small Sonoma Valley community had a second-quarter median sales price of $1.25 million, with two-thirds of homes selling for higher than $1 million. Sonoma — up by 30.5 percent — At $895,000, Sonoma‘s median sales price hit a three-year high on a quarterly basis. Prices ranged from $231,000 for what appears to be a fixer-upper from $7.1 million for a compound outside the city. Menlo Park — up by 19.8 percent — Menlo Park‘s $2.88 million sales price rose by nearly $500,000 since the second quarter of 2017. The largest real estate transaction was a $10 million-plus home that found a buyer in a brisk 18 days. San Francisco District 3 — up by 19.6 percent — Tucked away in the city’s southwestern corner, District 3’s median price of $1.32 million reached a three-year high in the second quarter. In what is becoming a rarity for single-family residences in San Francisco, 10 homes sold for less than $1 million. Novato — up by 18.9 percent — For the first time in at least three years, homes in the Marin County city of Novato reached the seven-digit range, climbing to $1.1 million. San Francisco District 10 — up by 16.1 percent — Encompassing neighborhoods such as Bayview and Hunter’s Point, San Francisco’s District 10 saw the median sales price end the quarter at $1.07 million, a three-year high. Prices in District 10 have been steadily climbing each quarter since the beginning of 2017. San Mateo — up by 16.1 percent — San Mateo‘s median price ended the second quarter at $1.75 million, with only two of the more than 160 homes sold garnering less than $1 million.